I’d have been unbearably remiss as a brew-tonian if I didn’t brave the big smoke to attend at least one Ontario Craft Beer Week event this past week. With an incredible array of events including tastings, concerts, meet-the-brewer and appreciation events across Ontario, OCB week is to beer lovers what comic-con is for nerds... in a word – tasty. We dropped into An Sibin Pub (“an sibin,” we’re told, is a name for an illegal Irish pub serving some kind of potato liquor. This pub, from the delightful Irish waitress to the sea shanties that played over the speakers all night, was a great find) for an event called the Battle of the Pilsners. 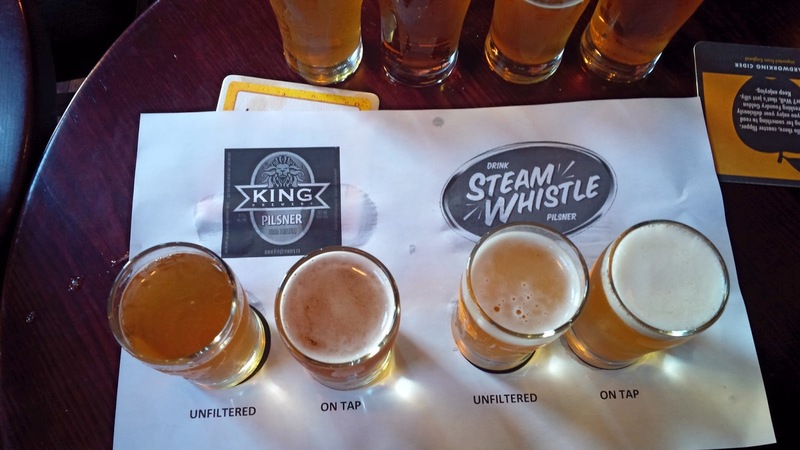 Never ones to shy away from a battle or a pilsner, we went to enjoy some samples from Steam Whistle and King Breweries. Most excitingly, we found they were serving unfiltered versions of each beer. Many home brewers and beer enthusiasts alike will esteem the superiority of unfiltered beer, claiming it has more robust scent and flavour profiles, is (usually) naturally carbonated, and is even healthier for you (filtering removes some B vitamins from the yeast, that remain in unfiltered beer). Filtering is done to clarify the beer and give it that golden glow we’ve come to expect; a practice much more common in North America than it is in Europe. I love the chance to try things in a “back to basics” form. In an overly processed world, beer, for the most part, retains a quite natural form. Your basic beer has few ingredients, no additives or preservatives, and goes through little in the way of processing (lucky us). But there are still steps, some of which people would call unnecessary, that some beer is subjected to (filtering, pasteurization, false carbonation, etc.). For this reason, it can be fun to see what a beer is like prior to any additional steps. Having toured Steam Whistle’s historic John St. Roundhouse, and being no stranger to the iconic green bottle, I was chomping at the bit to try the unfiltered version - and it did not disappoint. Both of us that tried it agreed the hops were more recognizable, the smell slightly stronger, and the overall flavour truly enjoyable (even an arguable improvement over its filtered brethren)! King Brewery showed up with a great pilsner of its own. Arguably more complex, the filtered and unfiltered versions were not as easily differentiated as they were with Steam Whistle. Notably hoppy, and easily recognizable against other domestic pilsners, I did get a slight hint of metallic taste, which was confirmed by the other taster. The beer certainly peaked my interest in the hyper-local King Brewery, which I will be sure to explore someday soon. Lesson learned: always take the chance to explore your favourite beers in their alternative forms. Simple differences like drinking beer fresh from the brewery can mean a whole new experience. Events, like the Ontario Craft Beer Week, are often opportunities for breweries to showcase these alternatives, and should not be missed. I love that we are seeing more unfiltered beers, ales, lagers, pilsners... Natural settling through rest and cool is best clarifier. And "damn" what's wrong with a bit of cloudiness? Beer is alive! "Damn" is right, Hugh! I don't want my beer to look or taste like yellow water. Craft beer will lead this change, as they do with most. I hope more unfiltered beers are offered both on tap and at retail. For now the only unfiltered beer I'm familiar with is Amsterdam's Boneshaker IPA which is REALLY nice if IPAs are your thing. I'll have to look for King Brewery's Pilsner when I'm in the city next.